The final Phase 3 is in our games and with it we have a really cool Mystery Box full of items you did NOT win in the Affection Meter and some decorations from around the Romancing the Clam Event Area. Now I am sure you want to know, just what is IN Rupert’s Homemade Valentine’s Box? Remember, in order to see the Mystery Box you need go be in Phase 3 content. That means COMPLETED My Funny Valentine Part 13 & started the Can’t Buy Me Love questline. There is also a shortcut to it in your game. Just tap on the Heart Meter Box in the lower Right Corner of your game. Once you get into the Event Menu Pop up, go to the Star Tab aka the “Featured Items”. You will see the link to GO to the Mystery Box from there. Either way, it is just a simple tap to open up the Homemade Valentine’s Mystery Box. Let’s take a look at what YOU might get for the cost of 1,000 Homemade Valentine’s a try. To start off, every item in the Mystery Box is unique and will disappear once you win it. You can see the Prizes YOU have left in the Box the same usual way… tap on the Green “PRIZES” button with the magnifying glass and it will take you to the breakdown. The prizes YOU see will depend on what LOVE/HATE Heart Prize YOU won for the Affection Meter. As soon as you win a LOVE/HATE prize, its opposite goes into the Mystery Box. 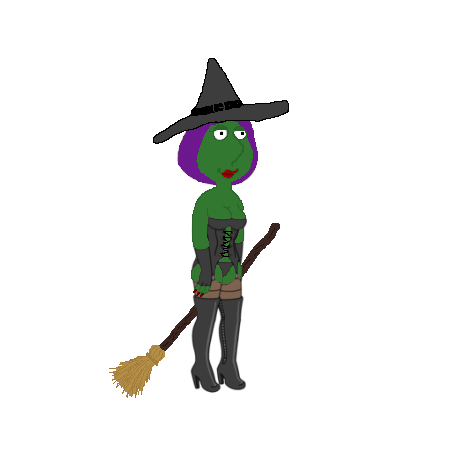 So if you have not yet WON the Voodoo Shop, Hot Meg will NOT appear until you have collected all the HATE hearts to get it. And vice versa for the LOVE side. Here are the Prizes from the Affection Meter. Again, you will only see these in the Mystery Box if you did NOT win them from the Affection Meter and won the opposite of it instead. Clammy Secrets (15 Hearts/Building): Sits on a 5×5 base. Pays out 8 Homemade Valentine’s & 20XP every 4hrs. It is a shop that resembles a very similar OTHER “Secret” named shop that women frequent. Will fit in with a mini mall area. 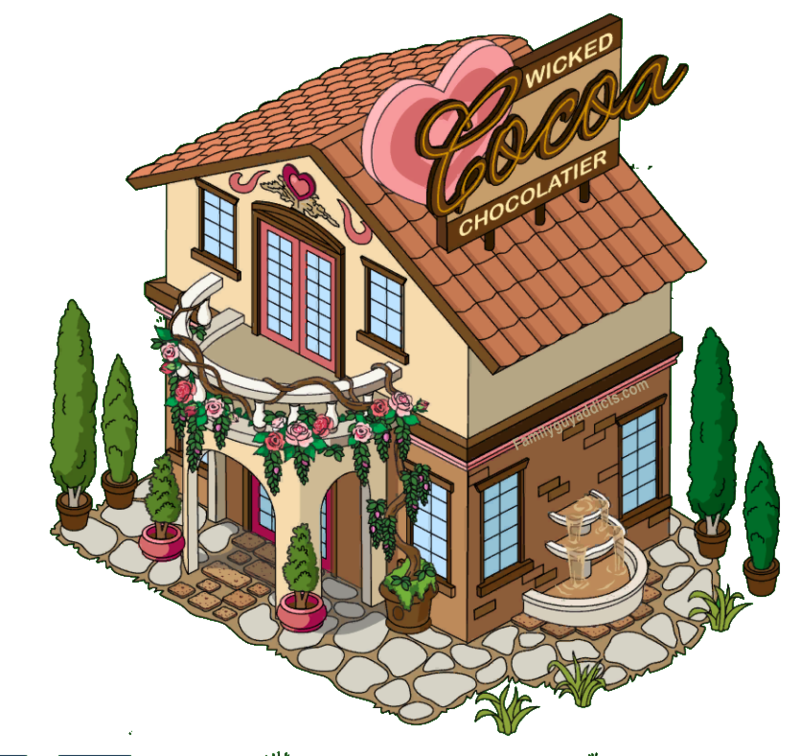 Wicked Cocoa Chocolatier (50 Hearts/Building): Sits on a 4×5 base. Pays out 16 Homemade Valentine’s & 40XP every 12hrs. Is not currently animated. The color scheme and design is pretty cool looking and gives the building a unique feel. 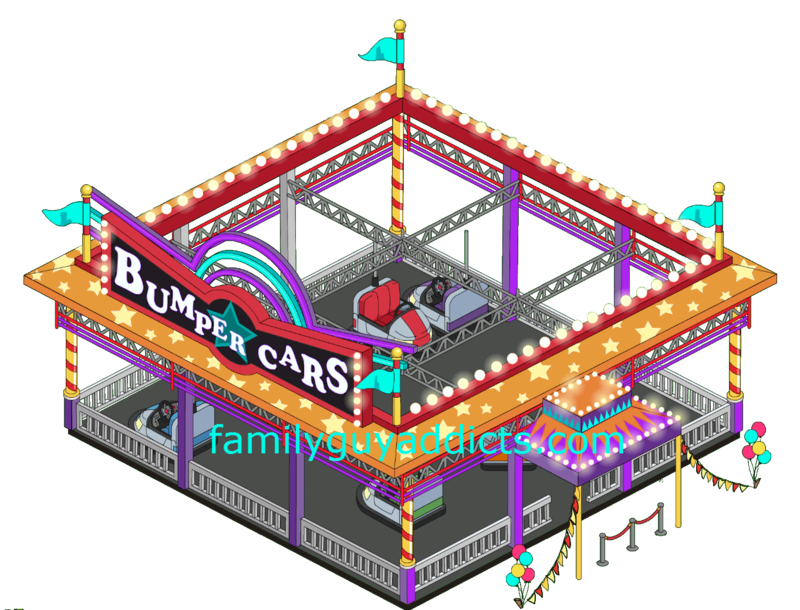 Bumper Buddies Bumper Cars (75 Hearts/Decoration): Sits on a 10×9 base. 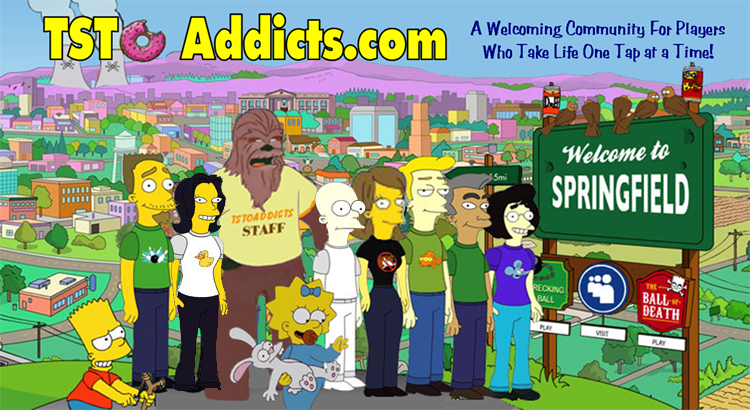 Is now animated. The cars move around a bit and bump one another when tapped as well as lights around it blink while the flags wave. Will go great in an amusement area. Kool-Aid Man’s Girlfriend (200 Hearts/Moving Decoration): This is a moving decoration. 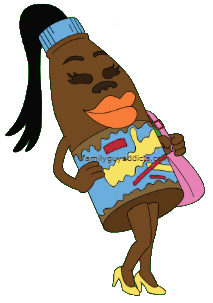 That means she is not a playable Character, but will roam around your Quahog streets with the other Characters. She is voice and says “YooHoo Baby” when tapped. Cupid’s Statue (250 Hearts/Decoration): Sits on a 2×2 base. Currently not animated. Is needed in order to unlock Cupid from his bench. It is a cute statue that will fit into a Park type area. Hot Meg (350 Hearts/Character Costume): This is a Character Costume for Meg. It comes with 3 outdoor tasks, a questline, and several other tasks that sound pretty funny. Right now all her tasks will payout Valentine’s. She also can go on dates at the Romantic Thoroughfare Park. 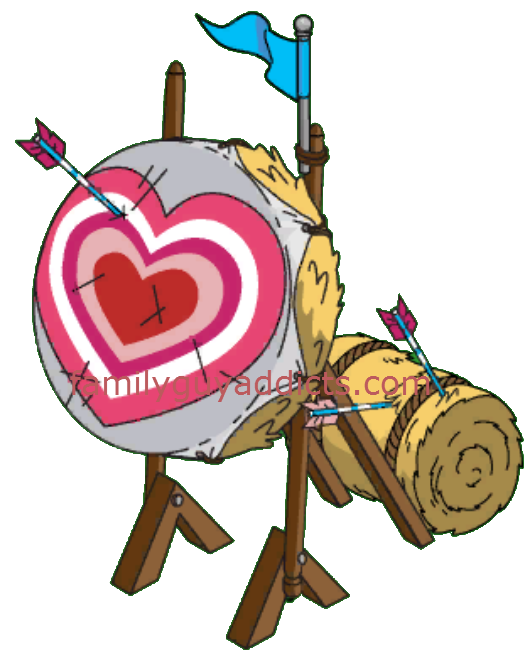 Crimes of Passion Archery Set (15 Hearts/Decoration): Sits on a 2×2 base. Currently not animated. Would probably go well next to Cupid’s Throne. 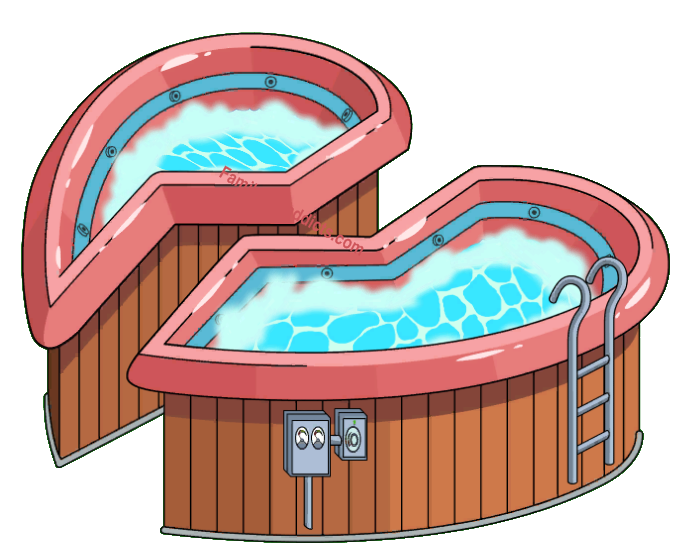 Cool Your Jets Hot Tub (50 Hearts /Decoration): Sits on a 3×3 base. Animation on the hot tube makes it look like the water is bubbling, churning around, and a lil bit steamy. Liquid Sorrow Liquid Store (75 Hearts/Building): Sits on a 6×6 base. Pays 6 Homemade Valentine’s & 20XP every 4hrs. Is not animated though the sign outside does give the appearance it is. I giggle it says Drive IN on it. Big Mouthed Girlfriend Dolls (100 Hearts/Decoration): Sits on a 3×3 base. Currently not animated. These pretty much fit with all other Quagmire’s “toys” and even the Clammy Secrets building. 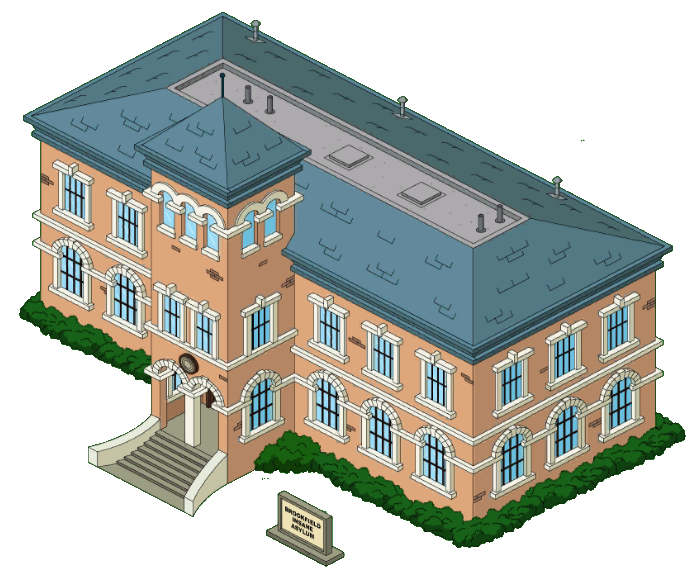 Brookfield Insane Asylum (125 Hearts/Building): NOTE: you will NOT get this in the Mystery Box if you already have one in your game from Halloween. Sits on a 8×11 base. Pays out 10 Homemade Valentine’s & 30xp every 8hrs. 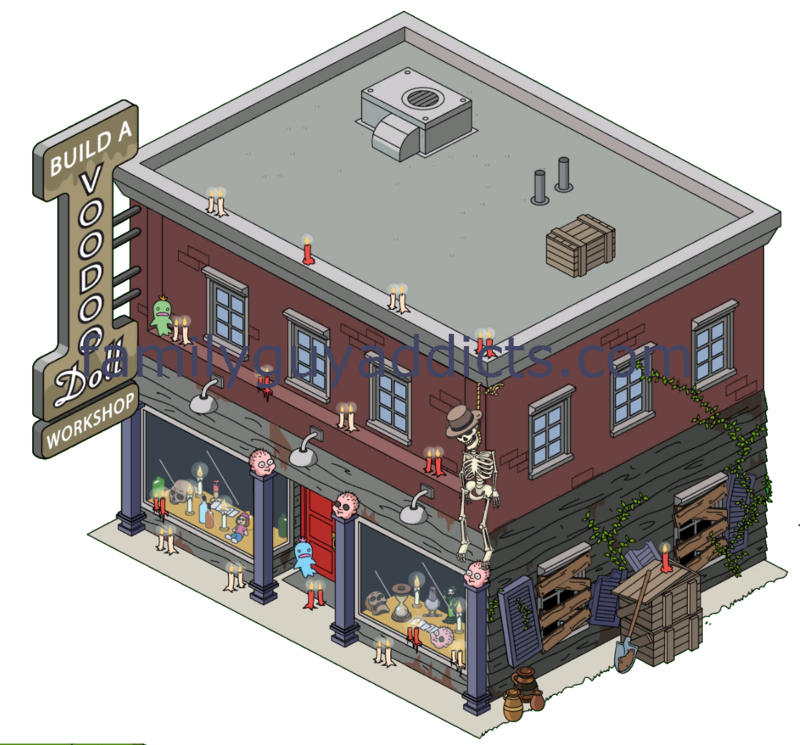 Mr. Needlez Voodoo Shop (150 Hearts/Building): Sits on a 6×8 base. Pays out 10 Homemade Valentine’s & 30XP every 8hrs. I really love the design to the building and all the little details in the windows. Not currently animated but the candles give the appearance it is. And now for the additional Prizes that Everyone can see. Many come from the Event Area. Morning Arousal Cafe (Decoration): Sits on a 5×9 base. The Cafe sign is animated with blinking lights and steam/smoke rises from the vent on the rooftop. It is a cool looking location, just curious as to why a decoration instead of a building. I really like the look of this building and the outdoor area. Casaroja Movie Theater (Decoration): Sits on a 6×8 base. Currently not animated. It is a cool looking location, just curious as to why a decoration instead of a building. Fancy Wishes Fountain (Decoration): Sits on a 7×7 base. Is animated. Water is spraying out of the two lil spouts on either side as well as the larger one in the Center. Not very high like the Event area. But noticeable. Cupid’s Throne (Decoration): Sits on a 5×9 base. The animation is very similar to that in the Event Area. The heart moves colors inward and blinks while Cupid works away on the letters. He will also try to fly off but is chained to his desk. 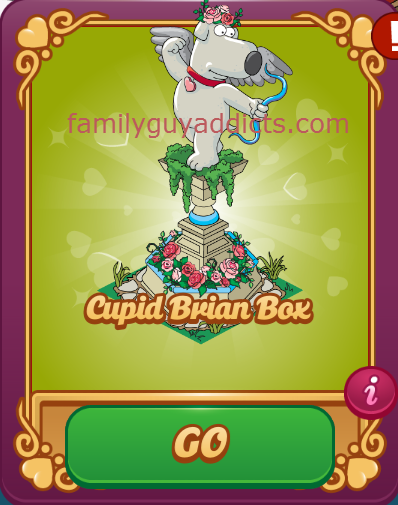 Cupid Brian Statue (Decoration): Sits on a 2×2 base. Animated. Lil hearts rise up from below the base of the Statue. It is a really cute statue. 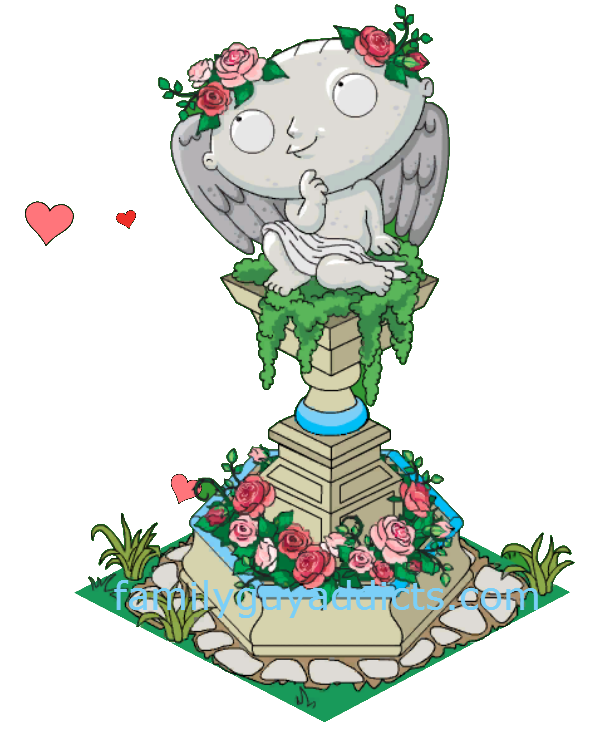 Cherub Stewie Statue (Decoration): Sits on a 2×2 base. Animated. Lil hearts rise up from below the base of the Statue. 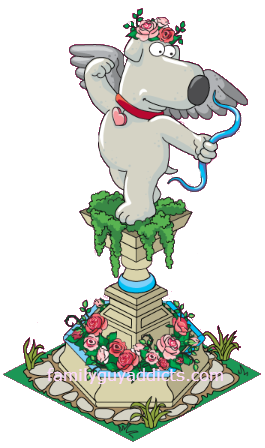 I love this statue just due to how cute Stewie looks. Lol. So every player will have at LEAST 6 items in the Mystery Box to win from the Event Area. Then up to 6 more from the Affection Meter depending on if you complete winning all 6 Love/Hate Prizes for each Character in it. That is a total of 12 prizes possible, so make sure you have at least 12,000 Valentine’s set aside for just the Mystery Box if you plan on getting it all. What do YOU think of the Rupert Mystery Box? Have you tried you luck at it yet? What success did YOU have? Like your Prizes? Worth it to you? Happy they put the Prizes you didn’t win in here for just Valentine’s? Let us know. This entry was posted in Game Play, Special Event and tagged Casaroja Movie Theater, Cherub Stewie Statue, Cupid Brian Statue, Cupid Statue, Family Guy Addicts The Quest For Stuff, Family Guy Tips and Tricks, Hot Meg, Romancing the Clam Event, Rupert Homemade Valentine's Mystery Box. Bookmark the permalink. I still had loads of homemade valentines day cards in the game but how do I get ruperts box ??? It is gone. Went with the Event when it ended Thursday. Sorry. I loved the Rupert’s box!! It was worth it for sure. Rewarding you with prizes that you may not have unlocked during the event is nice. And then using the event currency (valentines cards) to purchase those Rupert boxs actually made it worth playing the event more. 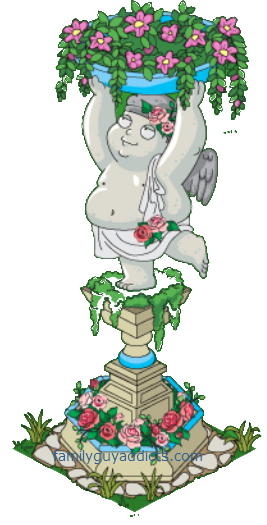 I actually got the cupid statue on my second try which was really lucky considering everyone else is getting it last and having a hard time getting it. But of corse I’m stuck on can’t beat love 4 so I won’t have enough time or cams to finish all the tasks in time so I can get cupid which makes having the cupid statue completely pointless, too bad I couldn’t sell it to someone who really needs it since I can’t use it. Or even if it costed 10 clams to speed up the 12 hr tasks like it did for the first 12 hr task then I would just be able to get cupid but noooo, they had to up it to 24 clams to speed up the 12 hr tasks they’re just trying to make it nearly impossible to get everything you need, I hate it. Any ideas on what to do? I sent a message to Tiny Co but thought I would ask ya’ll while I am waiting to hear back from them. What prizes have you NOT gotten from it? ALL? I found them!! They were hiding in my inventory. Sorry!! I used to be able to open these without issue. Now I receive a message that’s says, ” we have encountered an issue with your payment. Please contact Community support for assistance.” I have almost 4,000 Valentine’s Day cards, so this should be a no brainier. Any suggestions for fixes? It means that there is nothing else currently in there for you to get… so you either got it all. Or… need to win another Affection Meter prize so the one lost can go in the box. Is there anyone else that’s feeling my pain, misery loves company..
Yep, just opened my last any got everything but the statues, so no cupid for me. Seriously, all that is left is three statues, including the cupid one I need and two more broken heart decorations I can do without. Problem is I might be able to scrape together 2,000 HVs, one for cupid and one to get cupid… but Joes still stuck at level 9 so he can’t even unlock the cupid bench yet and unless I can scrape together 5,000 in less than a day, I have a 1/5 odds of getting Cupid. Yep, I wasted 6,000 HV on useless deco. The only one worth having is Cupid’s Throne. Is there going to be anything else to spend hearts or hmv on last minute or should i just spend everything i have left now on the mystery box and decos? We don’t know if any surprises last minute. I have emptied the box and all have 5000 Valentine’s and counting. Nothing left to buy. Wish the buildings connected rent and had a purpose (continued to allow dating tasks after event ends). Maybe we’ll be able to buy the buildings that costed clams with the Valentine’s post event???? That’d be cool. l’m up to unlocking hot Meg. I’ve tried the mystery box twice for previous prizes… the game seems to have given me the prizes in order so far. I sure hope it actually is a random prize winning, because I don’t have thousands of HVs to get every prize sequentially before I can get Kool Aid Man’s Girlfriend. I play regularly, and I have nowhere near the thousands of HVs people seem to have. What am I missing? Has anyone else received the mystery prizes in order? I mean, winning coffee shop first, then the theatre, etc.? I sometimes get that. Last box actually for donuts. It’s so random each time and varies by each player. I can’t render the exact order but I ca an tell you I got the archery set first, the hot tub second to last and the Cupid statute dead last (so frustrating & took a few days to reach). This is excluding the voodoo shop which I received after the box was previously emptied. I am all for Bunny and Alissa to get their own characters. For as much work as she and Alissa have done, I really think that TinyCo should create them. They’ve already created the storyline for the New Year’s Bunny, made the Bunny Ski Slope … How hard would it be to build their favorite fansite custodians into the game. Let’s be realistic, if they can work that hard on a storyline, they can surely finish it by putting a Sweet Bunny and Alissa into the game. Hi again and thanks again. I have read and read and read this post over and I understand that these prizes come from the box however I am still hitting a wall as to getting the fountain. I do not see it available in my box?? Please let me know if this is an issue that I need to contact TinyCo with? Did you tap on the green “Prizes” link as soon as you open the box to see what prizes are inside? Scroll through it left and right? Yes I did and its not there. Thank you for answering quickly. Very odd. If you didn’t win it and it’s not in your town, inventory, or Mystery Box…reach out to them from the game. Thanks I have messaged them. Wow shakes head found it! It was hiding thank you very much!! 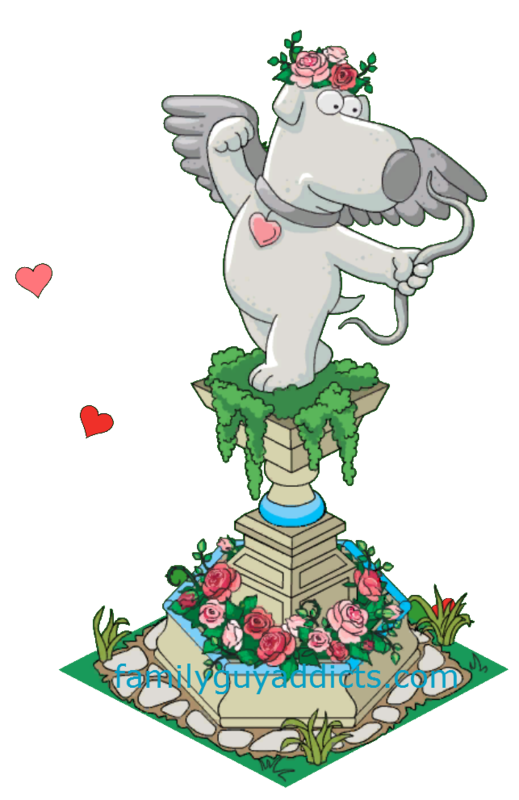 It took me 8 or 9 tries to get Cupid’s statue but I was able to unlock Cupid after getting it. I have 4 more quests total, between the main quest, cupid’s quest, and hot meg’s quest to finish before completing all of the freemium event quests. I’m currently at 712 HMV and only have one prize left in the mystery box. I don’t really care for the archery set but I might as well get it since I have excess HMV. Grrr. I need Cupid’s statue, and am getting everything BUT that. Lol. Keep going. Don’t give up. Still time to earn more Valentine’s. 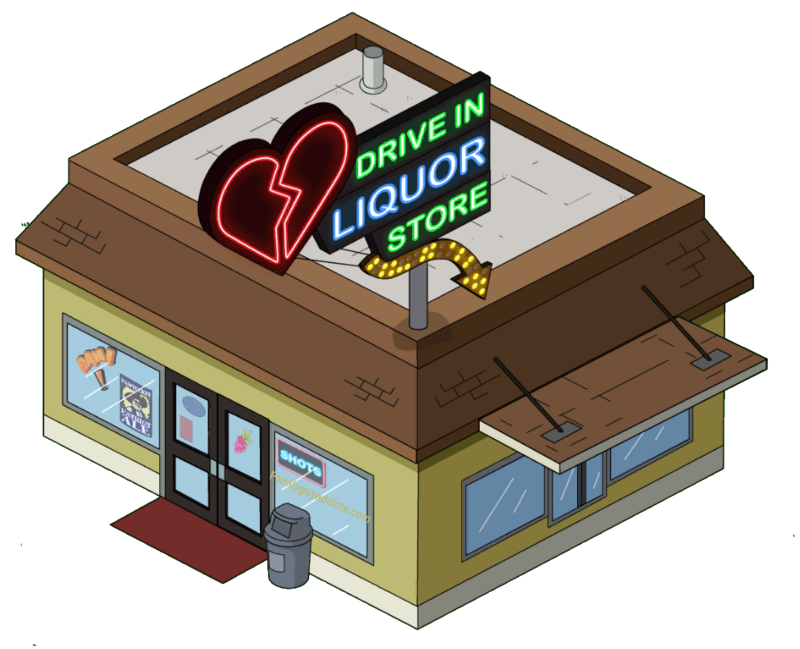 With one day left, I’ll have just enough to earn one more prize, but then not enough to give Cupid 1k valentines… But I have two insane asylums, which seems apropos.. And a voodoo shop! I’m hoping that the dating buildings are decorations because the dating will continue after the event for those with the decorations. That’s my hope at least. Just got Hot Meg! And to top it off Ida cleared a sprayer and came thru like a boss and dropped a clam! is there any point to continuing to collect hearts and valentines once you win all the fremium goals? perhaps tinyco has a stretch goal? Is there a way to get the Cupid stand after you get hot Meg? I went with the asylum on that one not knowing I would need it to unlock Cupid. Have u girls heard anything about the fence deco in the valentine garden or the the nice bench on weather they let us buy them? They r very nice compare to what is offer to us now. Theres like 3 different type of fences that is way nicer then any we have so far. Nothing yet. I keep pestering them I want MORE decorations for the game. I like the look of a lot of them and want them all the time. I noticed they arrive every 3 hours at 10, 1, 4, and 7. So it is possible to get two sets within a short period of time. If you wake up at 6:55 am you will get the couples from the 4am arrival and then five minutes later at 7 you’ll get the couples again from that arrival. It is more than just that. The timer says 1 or 2 hrs still left, but I got 3 spawns of PDA in a row. I agree with you Andrew that’s how I’ve figured out how it works and when they spawn. The pda couples stack for me, so if I miss two of their spawn times, they spawn right in a row when I do get on. @Bunny: I just unlocked Hot Meg – Mission acomplished 🙂 Thank you so much for all the help and hints, you and your fellow addicts make this game as good as it is. Youre the best! Keep up the good work! That’s a lot of huge decorations. Boom. First try and got Hot Meg. what happens if u click on rupert after u get everthing? Do u just lose 1000 hv? 31k valentines and there is nothing to spend them on, yes I got all the mystery box rewards. First off a huge thank you to everyone at this site! Where do I obtain the Fany Wishes fountain? I;m very disappointed that the cafe and theater are just decorations and not buildings. They are big enough to be and it makes more sense for them to be buildings and earn coins/valentines. Hopefully they change it for after the event. Is there any possiblity of that happening? Who made those beautifal drawnings of Bunny, alissa and Wookie? Just wanted to say thanks for all you do Bunny! It’s very much appreciated with all of your guy’s hard work. If you are having issues, there is troubleshooting help all over our site as well as a way for YOU to contact them so they can assist you further. Letting people know what is wrong to start off may help. first of all “please” would be nice cuz they dont work for tinyco and what happen to doing things yourself? Do people forget how to these days? Unbelievable. Read that earlier and still SMH. I think TinyCo have judged this event almost perfectly. I have just bought the last mystery box prize, Cupid and all other freemium items and have about 200 cards left. Have been playing quite a lot though, so I feel sorry for people that haven’t been able to for whatever reason (always think timed events that give characters are a bit unfair if you happen to be out of the country and can’t access the game). Can’t understand how people have everything AND 40k cards still remaining (!). My only complaint is that the PDA couples were so annoying at the start and the inability to see what affection meter prizes were coming up… and TinyCo improved both of these after feedback (and the mystery box is a great touch). yessss unlocked EVERYTHING just now! !..lol have 250 homemade Valentines left after buying the last 3 prized in this mystery boxXx. waitin on Hott Meg to finish creating in 5 more minutes ❤ !! complete success this event was. I have 40,000 homemade valentine’s and completed everything. What can i do with all those cards ?? Hang on to them to see if anything else hits last minute. I’m pretty disappointed I went for the asylum as a prize not knowing the statue was important. Finally got to the phase to unlock Cupid and it doesn’t let me use clams to buy him like usually with other characters and in the time left until the end I cannot save enough cards to gamble with the mystery box. I don’t think it’s fair that we can’t buy him. The first time I feel like I got screwed over big time! I opened the box three times tho and all I got was decos. Let them know your thoughts. Their intention on him was a legit “NO CLAM” Character. So they opted to not have any Clam options on him. Yeah okay makes sense. Thanks for the reply I first thought my game glitched since someone said here that they were able to buy him. I guess they actually just used the clams to get more cards then. Well I won everything in the mystery box . It’s now sat empty but still displayed as though I can open it. Oh don’t do that lol. I was wondering what would happen. You HAVE GOT to tell!!! Lol OK TY for the screenshot Bunny! I had been wondering if there was some sort of hidden or invisible prize inside. Ya never know with TinyCo. Gotta keep on my toes, just in case! Lol. I already got all of the prizes. I went with the love prizes all the way down the meter even with Hot Meg. Love her animated task with Quagmire. I’m not sure if this is where I ask this… But I have already won all of the hate or love prizes from the affection meter. Is there a reason I should still be sending people on dates to collect hearts or clearing pda couples to collect hearts? Will the hearts you have left over be able to be spent on a mystery box or will they just disappear once this event ends? We do not know if anything else will hit, so I am still collecting up to the last day.